Portugal’s a hot destination this year, popping up on lists of places to visit at Travel + Leisure and Fodor’s among others. My husband Bill and I are looking forward to seeing this slice of the Iberian Peninsula on a river cruise. 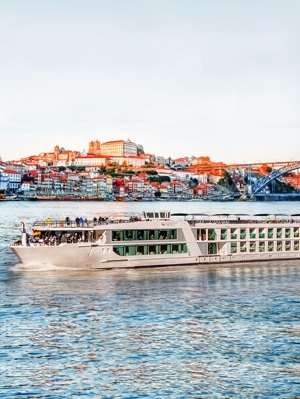 We’ll be aboard Emerald Waterways’ new ship Emerald Radiance on its new “Secrets of the Douro” itinerary through the Douro River Valley. Meaning “River of Gold” and now designated a UNESCO World Heritage Site, the Douro was not navigable until a series of dams built in the 1950s and ’60s allowed a more controlled flow of the river. 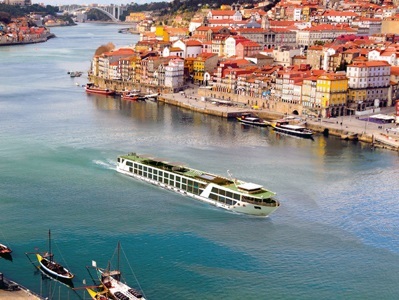 We’ll stop at a variety of spots in Portugal ranging from the World Heritage city of Porto to the Roman settlement of Regua before cruising east into Spain to Vega de Terron. We’ll explore the village of Lamego, see prehistoric carvings in the Coa Valley Museum and make a day trip to Spain’s Roman city of Salamanca for a firsthand look at the seat of the Spanish language and a feel for life in medieval times. And we’ll be traveling in style on a newly built Emerald “Star-Ship.” Emerald Radiance carries just 112 passengers for an intimate river cruising experience. It boasts extensive open-air public spaces so we can enjoy a barbecue on the Sun Deck or take a plunge in the open-air pool. We’ll have a chance to enjoy the warm Portuguese climate and vineyard-strewn panoramas. The river travels through some of Europe’s most beautiful wine-producing villages with beautiful backdrops on either bank. 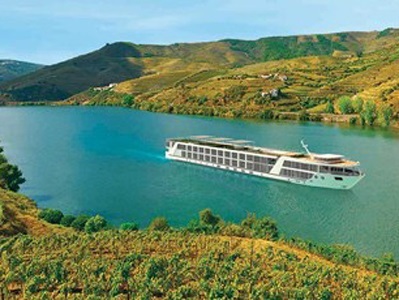 Emerald Waterways is Europe’s newest river cruise line, having launched in 2014. In just three short years it has received awards for Best New River Ships and Best River Line for Value. Emerald Waterways has included tours and excursions in every port and EmeraldPLUS programs provide passengers the opportunity to experience some of Europe’s unique, in-depth cultural discoveries at no additional charge. All Emerald Waterways sailings include at least one EmeraldPLUS experience. Day 1: Welcome to Porto. Located at the mouth of the Douro River, Porto is an eclectic mix of modern and ancient architecture. Day 2: Pinhao. Enjoy a full day sailing the windy turns and twists of the Douro Valley. A UNESCO World Heritage site, this area is sparsely populated by quaint villages and typical communities working vineyards and small farms. Your Cruise Director will host a lecture on board showcasing the history and wine culture of the region. Perhaps join a painting class of local mosaic tiles. Later this afternoon, arrive in the village of Pinhao which is situated on a river bend surrounded by terraced hillsides producing some of the world’s best port. Tonight your captain will be delighted to host the welcome dinner and cocktail reception. Day 3: Pinhao – Vega de Teron. Today visit the baroque village of Lamego. Visit the remains of a Roman sanctuary and battlements. Return to your ship for lunch and an afternoon sailing to Vega de Teron, your gateway into Spain. EmeraldPLUS: Join your barman for a lesson on how to make cocktails using port wine on board. Day 4: Salamanca. Founded in Roman times, the city of Salamanca is home to one of the oldest universities in Europe, the seat of the Spanish language, and still a lively student town. With its grand squares and medieval structures, a walking tour here is more like stepping back in time. Tapas bars can be found on almost every street and traditional Spanish music trickles out of bars and restaurants. Board your coach this morning in Vega de Terron and travel to this beautiful golden city with plenty of free time to explore independently before returning to the ship later this afternoon. Day 5: Pocinho. This morning arrive in the village of Pocinho and embark on an excursion to the Coa Valley Museum. This impressive concrete structure details prehistoric stone carvings made by the early inhabitants of the Douro, which were uncovered during the construction of the nearby dam. Later return to your ship for lunch and enjoy idyllic surroundings as you sail toward Regua. EmeraldPLUS: This evening dinner will be hosted at a local winery estate. Day 6: Regua. Wake up this morning in the former Roman settlement of Regua. Visit the Douro Museum for a look at winemaking in the region. Discover More: Guided excursion to the Mateus Palace (extra expense); guests on this option will not be able to attend the included tour of Regua.